The Serruys family lived in the Belgian town of Menin (now forever associated with the Great War). Edmond Serruys was a wealthy textile mill owner. 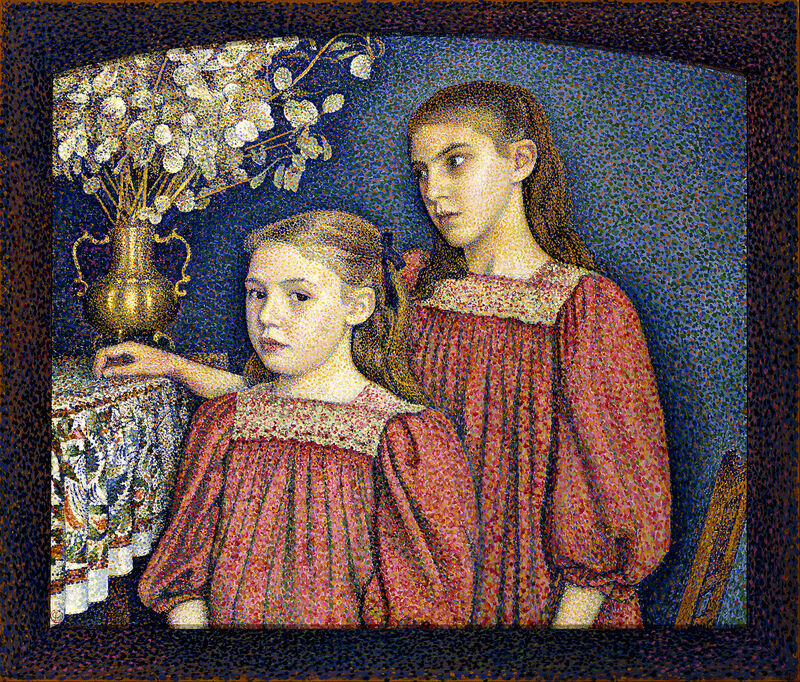 Georges Lemmen’s connection with the family was through the older sister of the two girls featured in this double portrait who had studied painting with him. This is the last pointillist painting executed by Lemmen but is surely one of the very best Neo-Impressionist portraits and a supreme example of the what is possible using Neo-Impressionist techniques. Lemmen has used ‘simultaneous contrast’ liberally throughout the composition to produce a surface that shimmers and dances – in the the background he has employed the classic juxtaposition of complementary points of orange and blue pigment. The girls’ smocks in turn stand out from this blueish backdrop by the use of red and green complementaries to give their attire real presence. The penumbra or halo around the two sisters increases the sense of depth as does the table covered with the brightly patterned cloth to the left. The brass vase, holding a large bunch of Honesty, is given real volume in a masterful display of Neo-Impressionist technique and an elegant pointillist painted frame, which tones with the background, perfectly complements the composition. Lemmen emphasises the differing identities of his subjects. The two girls wear identical clothes but in terms of their features and hair colour they are quite different from one another; the younger girl is fair and her gaze engages the viewer whereas her older sister has a darker complexion and seems quite intensely introspective, her somewhat unfocused stare fixed well outside the bounds of the painting.